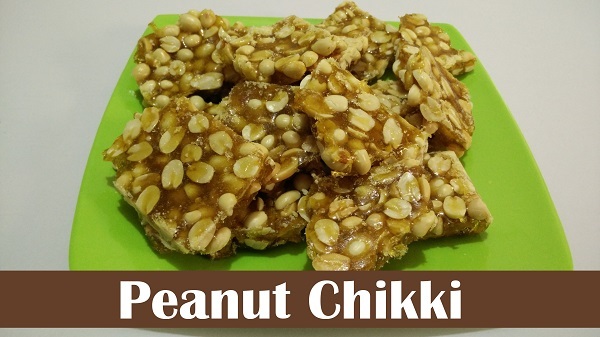 Peanut Chikki or Peanut Brittle is made from roasted Peanuts / Groundnuts with either Sugar or Jaggery. In this recipe, I will show you how to make Peanut Chikki with Sugar. It is a great replacement of chocolates for kids as it satisfies your sweet tooth. It is normally eaten during winter. Heat 1 tbsp Clarified Butter in a wok over the low flame. Add Sugar; stir continuously over medium flame till it melts completely. After sugar is melted, lower the flame and add roasted Peanuts. Grease a plate with Clarified Butter to set the Chikki. Shift mixture of Peanuts & Sugar in greased plate and spread evenly. Remove from plate and cut into desired size pieces.